The vivacious Ratsky Nightclub in Al Karama Hotel of Dubai is basically an in-house Filipino nightspot that is simply hard to resist, if you are true wild clubber. The things which make this venue so alluring include its electrifying music that is played by arty Djs, plus a rock band who perform at this site makes guests to climb on the dancing floor. Excellent sound system and stirring lighting makes the environment of Ratsky Nightclub more modish and electrifying, as these things gave it techno style of theme. It is hard to leave a nightclub like Ratsky, which offers so much fun, operates late till night and most important of all access to this spot is quite easy for people in Dubai, as there are numerous bus stops and a metro station nearby. For vibrant clubbers Ratsky Nightclub is a venue that is hard to resist because this Filipino club has a great vibe, which never seems to escaping. Stirring lighting basically showcase the techno theme of this sparkling club. The interior is also nicely done, as it is well-defined, while the music is played by talented Djs and a mindboggling rock band. All these things together create a thrilling atmosphere due to which it becomes hard for clubbers to leave this nightspot. The operational hours of this nightclub begin at 9:00 pm and come to an end around 3:00 am in the morning every day and this site opens on all days of the week. Al Karama Hotel, 12E Street - Dubai - United Arab Emirates. 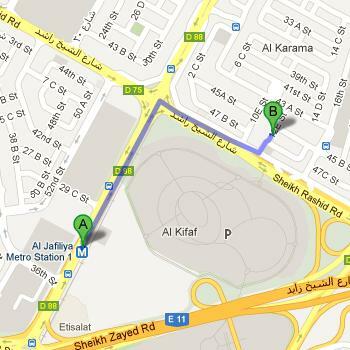 Head northeast on Sheikh Khalifa Bin Zayed Street/D 88 towards Sheikh Rashid Road/D 75, then turn right onto Sheikh Rashid Road/D 75, from where you should turn left onto 12E Street. The destination will be on the right at this street. Al Karama Bus Station 1 - 45 B St – Dubai is located at a walking distance of 350 metres from Ratsky Nightclub and this gap can be covered in about 4 minutes time frame. You can get to this stop by using bus number C3 after which head southwest towards 45 B Street, then take a sharp right turn onto 45 B Street that will bring you to a roundabout, from where continue straight to stay on 45 B Street and finally turn left onto 12E Street that will lead you to the destination on the right side. See the map for directions.